Which also has some animations over a period of days, if you like. Along the way, I got to looking at some of those images of snow and cold and white. 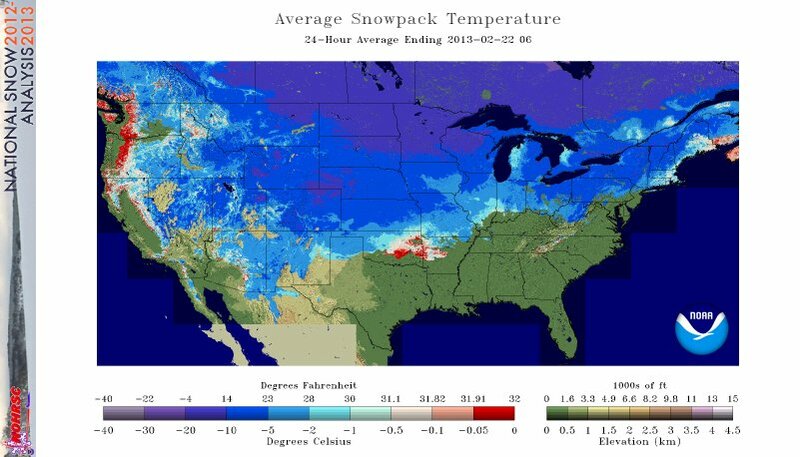 Yes, it is winter, but an awful lot of the USA is covered in snow. And snow is simply not warm. This is not a ‘warm snow’. All in all, an interesting place to see the snow and poke around in it from the warmth of your living room. The nice thing about that one is that it shows the ‘normal’ as a thick line. Lately we’ve been ‘snowing outside the lines’, but it does change from week to week. New all time record low temperature for the Northern Hemisphere. Nearly -100F in Siberia. Models are currently calling for the possibility of snow in Florida next Sunday / Monday with snow as far as Gainsville and freeze to Orlando. Some interesting experiences coming up for spring break. Though there seems to be much confusion about that Russian cold temp, exactly when, and what, and where… it is pretty clear that this snow all over the world is not a “warm snow”. It isn’t caused by warming. It doesn’t bring warming. It’s just darned cold. IMHO the proper thing to do when someone claims the snow is due to Climate Change / Climate Weirding / Extreme Weather Events / whatever… is just to say “You mean Global Warming is really cold?” and then laugh at them. We’ve reached the land of “not just wrong, obviously and insanely wrong” for the Global Warmers. This weather is NOT warm. It isn’t even close to warm. It is clearly a very cold turn, much like during the last “Major Solar Minimum” events and it clearly shows that something in the absolutely normal cycles of solar and lunar / tidal processes is in control of our weather. Not CO2. It’s time for the “Global Warming” crowd to recognize that their Emperors have no clothes and their story is looking very dumb. That is, in effect, the same as making all those mountain ranges taller. That ought to lower the ‘snow line’. I expect we will see lots more growing glaciers in the coming years. Mount Hamilton, near me, was covered in snow to a ‘lower than usual’ level just last week. Yes, it melted off. But during the 90s it had become rare to see snow on the mountain at all in some winters. Now we are getting it several times each winter. Like “the old days” of the ’70s. Or perhaps a bit more. This entry was posted in AGW and Weather News Events and tagged Global Warming, Snow, weather. Bookmark the permalink. Here I’m at around 45°N and around 6km west of the Greenwich meridian, and it’s 1.2°C out there and snowing. When I was first here, around 11 years ago now, having a barbeque in February was quite normal, as was working the vines in a T-shirt in February when it was a sunny day. Air temperature of maybe 5°C according to the thermometer, but feeling warm in the sun, and some days of 18-20°C air temperature as well. It’s still generally better than the UK, but it’s pretty obvious that it’s generally not as pleasant weather here than the locals are used to. Where this really shows is in the design of the houses – meant to keep cool and thus comfortable in summer, and just not insulated well enough for the sort of winters we’re starting to see now. Another pointer is the depth of the water pipes, where the odd foot or so deep has been fine for a long time, but is now looking a bit marginal. Oh well – at least it’s still better weather in general than the UK, and the radar traps on the roads are very well signposted. Thank you, E. M. Smith, for the role you play in reminding people of the discrepancy between reality and government propaganda. Reality is much easier to understand than the pseudo-scientific propaganda that paraded as consensus science after1945: The Standard Solar Model of Hydrogen-filled Stars; The Big Bang Initial Creation of Hydrogen from Nothing; Oscillating Solar Neutrinos, etc., etc., ad infinitum. I regret that it took so long to decipher the puzzle P. K. Kuroda assigned me in 1960. Now, 32F and another blizzard. About 1/2 of the 14.2 inches had "melted/compacted" from the one that ended Saturday night. They are calling for 6-12 for sure, and we're right on the line for 12-24". Have two already with wind driven snow. 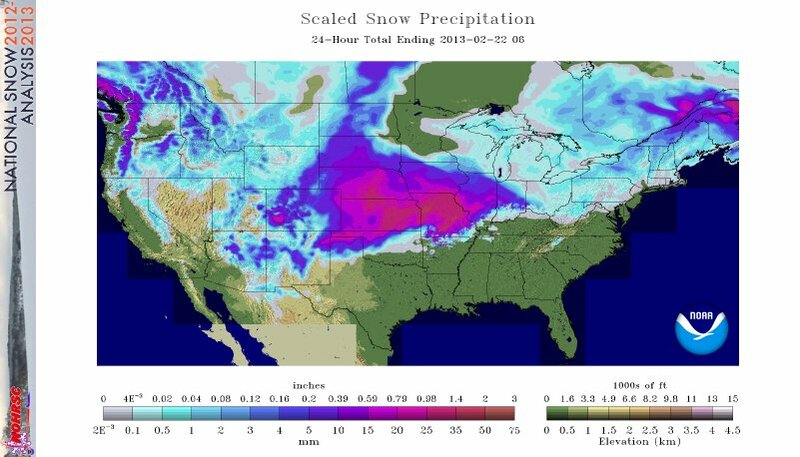 If wichita, ks gets 5.8" inches out of this, it will break the record for all time snowiest month since………………………………………………………1899. That was the time of the massive buffalo herd collective farting protest against the Indians releasing GHG methane into the atsmosphere. “Global Warming?…..another expression of Hollywood Science” Khabibulo Abdusamatov, head of the Pulkovo Observatory, Saint Petersburg, Russia. could be a concern for structures. whiteout conditions… making travel extremely dangerous. make travel nearly impossible. This is a life threatening storm. you. If you get stranded… stay with your vehicle. Now where is that corkscrew, time for some bioflavonoids. And caloric fuel with metabolic enhancers! Can’t forget that ethanol directly enters the Krebs / Citric Acid cycle and makes ATP to keep you warm! I can’t imagine that endless snow makes it any more interesting than sunshine and endless grain fields. Goodland or Colby, probably Goodland. Sorry to clog your blog with inane comments. This white AGW is boring me to tears. What have you got against Chablis and Chardonnay? Nothing wrong with ‘white stuff’ at all, IMHO!! Ah well, enjoy it while you can. We’ll have a few more drenching downpours of ‘liquid sunshine’ before the winter is over. But at least we have ‘respite’ days of a bit of sun and warm in between. Hotter & Drier: The west’s changing climate. ❝ Scientists have found a new source of the coldest, deepest waters, and they have done it with the help of seals. Warm snow? no! The concept is silly, one of my earliest memories is of playing in snow, was the impression I got from that experience that snow was warm? no! my tiny frozen fingers felt the pain. There is another myth going about, it’s that Ice doesn’t form on windows anymore, I have a skylight, it’s a double glazed window built into the roof to shed light on a staircase, it is currently frozen over, I spotted it glimmering in the moon light, so as the inquisitive type I am, I fetched a set of step ladders, climbed up and scraped my fingernails through the ice, the adjacent room facing the skylight (south easterly facing) the thermometer on the window-sill read 6C. BTW the view of the full moon tonight from that window was amazing, large moon halo too. Our snow moved out last night, which is what you are getting now. The skies have cleared, and it got up to about 32 F today, but the temperature has dropped to 12 F tonight (Monday) at about 8:30 pm Mountain Time. The moonrise was gorgeous and the moonlight is reflecting off the snow and it is really bright out tonight. If it has to be cold and snowy, it might as well be pretty. We hardly had any wind ( for us, anyway ) with the last two snowstorms, so the snow hasn’t drifted too badly. I didn’t know that snow could fall mostly straight down, I’ve only seen it fall sideways. :) I hope you don’t have to shovel too much of that warm snow, as I am sure it is worse than the cold snow we usually have. 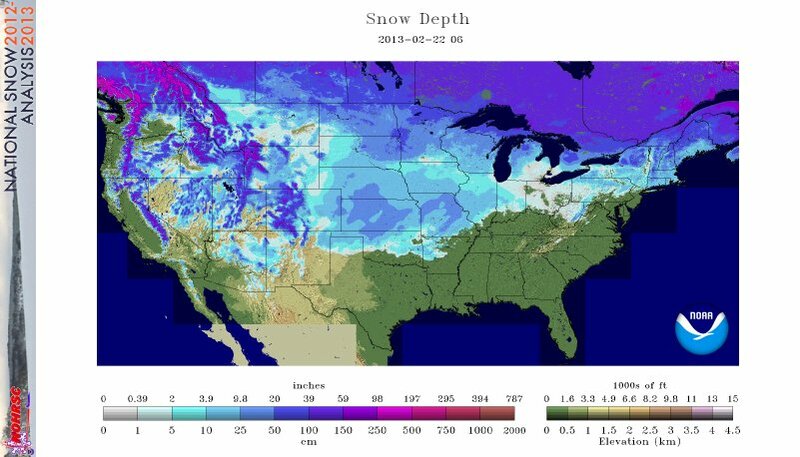 A few years back, I looked at the “snow depth” map and wondered how accurate it was. I found a spot about 150 feet from the house and what appeared to be neither blown out by the wind nor piled up. I measured the depth in several places and they were all about 11 inches (I think). That category on the map goes from 25 to 50 cm (9.8 to 20 inches). As best I could plot the location with that map – my snow depth did fall in the category. I did notice it was cold snow, by the way! This morning (Mon. 2/25) we woke to a thin while blanket of snow. By about 10 AM it had all gone away – sublimated, neither the concrete patio or the ground got wet. The wind went from about 9 mph to 24, then 30 (averages), while the gusts hit 39 mph. The strong winds lasted 6+ ours, then dropped again – now at 10 mph. These changes happen very rapidly, as though a switch is thrown. This is “burn the fields and ditches” season in the valley and sometimes the burners get caught by this action. I’ve been out when wind speed went from near zero to 35 in under a minute. It’s too cold and windy to be experimenting with the outdoor stoves but I’ve been reading the posts. Much appreciated your comment on grilling versus BBQ. My wife is from Atlanta and we would frequently visit the Old Hickory House in Atlanta and the Hickory Pit in Savannah. John, I think you live 100 miles east of me. I can vouch for there being some wind in your area, like ten months of the year. I am a little surprised it drops below 20 mph, ever. Well, not ever, I have been there looking for wind and it didn’t blow. Judy, you paint a pretty picture of the moonlight. Something I miss living here around Seattle. The gray does seem to settle here. Oh, it can be pretty here, but the time between can pull you down. Great exercise keeping up. On the matter of the chattering classes resistance to reality, we who dare to question are evil deluded fools, they know we are wrong, and nothing will shake their warm fuzzy group think. Hell is gonna freeze over and still it will be the talking point of the day. Have been avoiding the computer and this topic , as I am intolerant of idiocy over weather just now. But over at American Thinker Feb 24. 3 reasons conservatives are losing the battle for America. Nails the sense of mission impossible I feel when arguing against the group think of combatting CO2 emissions. I need to think on this, but it reinforces my inclination to go fully underground work wise, as if true the only way to return society to reality is let the brainwashed run out of money. Maybe I should get a government job and hasten the collapse. Hell even my wife has bought the weather BS, on seeing snowfall in Texas on TV, its unusual weather, never snows in Texas. Thanks, E.M., for the comment and for fixing the link above. Tomorrow I will try to find how to make hyperlinks work on the pdf file. Odd you would say that… At about 20 years old, maybe ’73? I saw that Social Security and pensions were a Ponzi Scheme and would not be there for me. I’ve planned much of my ‘life plan’ around that understanding. Right now, frankly, I have too much ‘assets’ and the government is trying to find ways to take them. From my POV I was just preparing for the inevitable. From their POV I’m ripe for plucking. So, despite never having taken a dime in unemployment or any other sort of help or aid since the one time I got an unemployment check for about $18 is about 1971; I’m looking at things and thinking that the “highest and best use” for me is simply to become a burden on the system. I have all of something like 5 or 7 years until that happens anyway… so I’m thinking that “go ahead and do it now” makes a lot of sense. About a decade ago I had a business that was booking / turning about $50,000 / month. Had 12 guys working for me at peak. What “The System” told me was that this behaviour was not appreciated. So I stopped. Just let it run down and go to nothing. Sad, and “wrong” in one morality play… yet that was what “The System” told me to do. Now I’m being told “Just be a burden on others, it pays best”. If offends me and so far I’ve resisted. Yet… How long can a person do what is a dead weight loss in the face of ‘easy living’? Well, it seems like that. My electricity was just reconnected. Went off about 9 pm. I wasn’t really prepared, I guess. It hadn’t happened since I’ve lived here. Oh, I had flashlights, candles, vino. ;<) But it was strange. Absolutely nothing to do but crosswords and such. The biggest inconvenience was my wi-fi didn't work of course. well doh. It just never occurred to me. I'm sure I still have the cables around here to make it happen, but thought they would have the problem resolved by morning. I had the gas look lthrough yuppie fireplace on when the power went off, so no worries there. Kept the house about 62F, as of this morning. I'm debating whether to start shoveling so i can get my pickup out, but I'm still sore from last week. I'll probably let the main driveway melt since my wife is gone. Three car garage and i have to park outside, guess i'm a hoarder of future useful items, mostly tools and such. There should be no questions regarding the snowiest month since 1899. As of 1 a.m. Tuesday, the Wichita area received 5.6 inches of snow. We'll see if that makes headlines. @P.G. Have to try those old refrigerators running with kerosene. Same problem I have, morally I object to acting in a manner I know to be damaging to myself. Government work would kill me quickly. I have wondered if the practical solution would be, to do an end run around the media and the uninformed voter. The distaste for politicians is pretty much common in all english speaking countries, if none of the above, was an option on the ballet I believe that choice would win in most elections. So if I change my name to None Of The Above or Zzz1 None of the Above, to ensure bottom of ballot position, collect the required number of nominees, pay the fee and then do nothing. With a small effort one could arrange likeminded persons in each riding,( Zzzz # 1 to X) and probably form a majority. Now this is a low budget practical solution, if troubled by media coverage, I can insist this is a legitimate protest, if None of the Above is the voters choice, law will be passed to permanently add NOTA to ballots and those politicians who lose to NOTA in future elections, must retire from politics. But the hang up is my self delusion, I have not wanted to acknowledge how lazy and stupid we have become,my sense of sanity has required a belief we are capable of intelligent behaviour. That people will chose productive choices over destructive if given an informed choice, but the 3 reasons conservatives are losing the battle for America, makes the case that we can talk all we want, liberally indoctrinated people are not going to listen unless we are perceived as friends of group think. Honesty is not a valid policy? ?